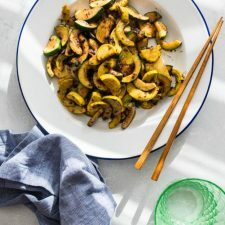 With 3 ingredients, 5 minutes prep time, and 5 minutes cooking time, you get a much more interesting vegetable dish that you actually enjoy eating. This recipe is my mini-blog series on homemade black bean sauce. Just a quick recap, I showed you how to make a black bean sauce in advance, so you can shake it and use it to cook varies types of quick and easy dishes. For example, Stir Fried Chicken with Black Bean Sauce and Fish with Black Bean Sauce (Baked and steamed versions included). In this post, I want to share an example of how to use the black bean sauce to make a quick vegetable dish. And of course, you can use the same method to cook many more vegetables to add a quick side dish to your dinner. For example, you can use the black bean sauce to replace salt and soy sauce in my 4-Ingredient Fried Cabbage recipe to make black bean sauce cabbage. Or, you can replace the soy glaze in my Oven Roasted Green Beans recipe, to make baked black bean sauce green beans. If you didn’t make the sauce in advance, no worries! You can still quickly whisk it up in five minutes. 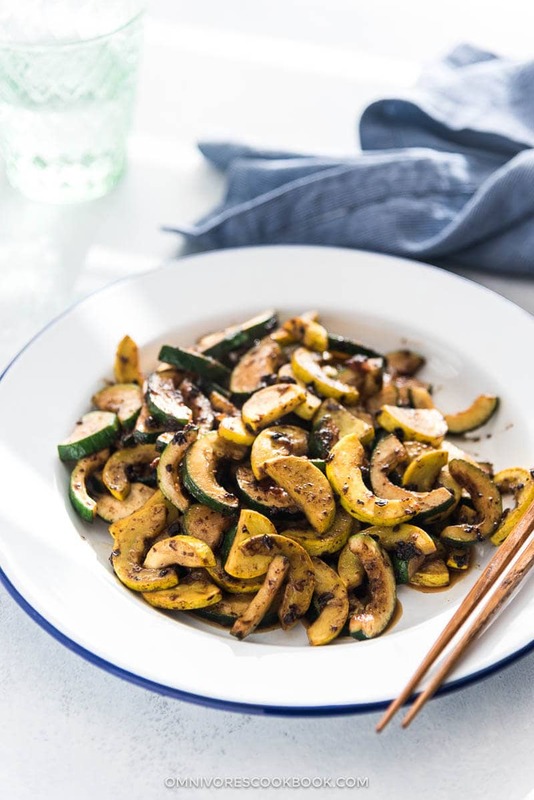 There is only thing to note in this recipe – removing the seeds from the zucchini will make your dish less watery and more flavorful. It is a method my mom insist I follow all the time. 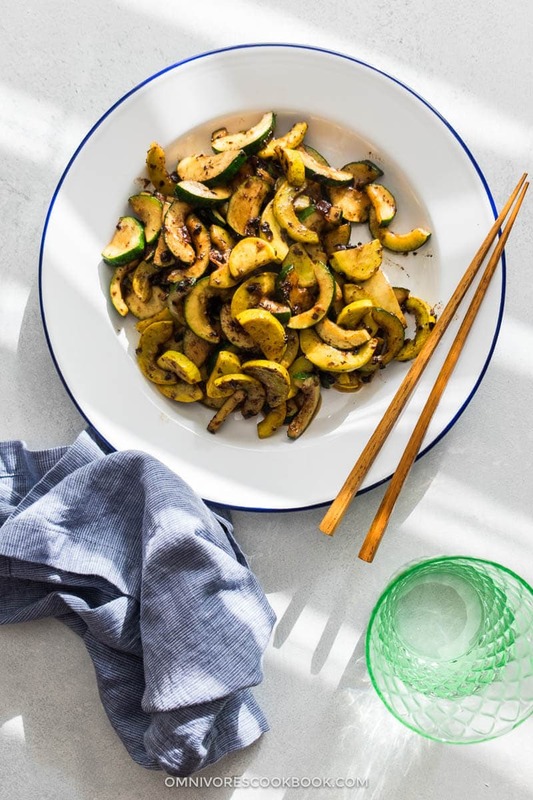 To remove the seeds, use a small sharp spoon to scoop the center tender part of the zucchini, so you will get a boat shaped zucchini. Then, slice it for stir fry. If you skip this step, you might need to make a cornstarch slurry (1 teaspoon cornstarch + 1 tablespoon water) and mix it in at the end of the stir fry. It thickens the watery zucchini juice and makes the black bean sauce coat better. If you like the black bean sauce, you should definitely check out my original blog post about it. In the post, I list all the options of protein and vegetables that you can use with the black bean sauce. Once you try out a recipe or two, you will get the idea and can start cooking dinner without using the recipe! Rinse the fermented black beans with tap water, drain, and transfer to a bowl. Use the back of a spoon to smash the beans. Add garlic, Shaoxing wine, light soy sauce, and sugar. Mix well. Heat oil in a large skillet over medium high heat until hot. Add oil and swirl the pan to coat well. 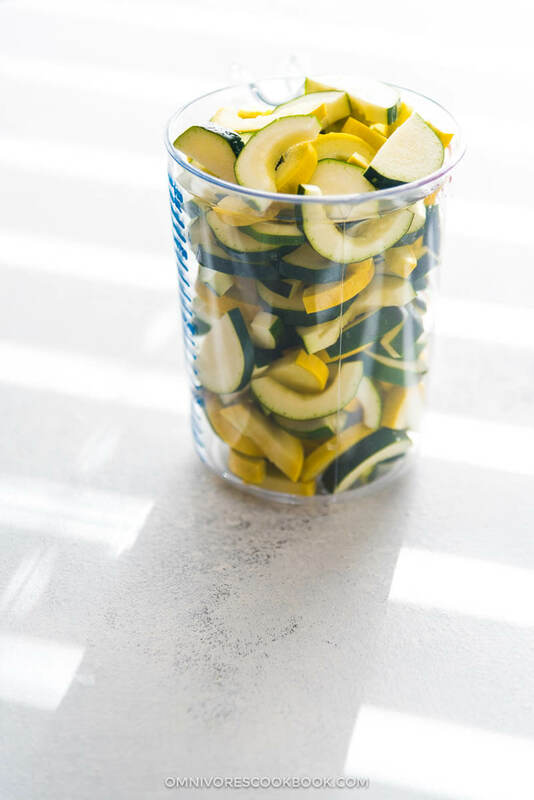 Add zucchini. 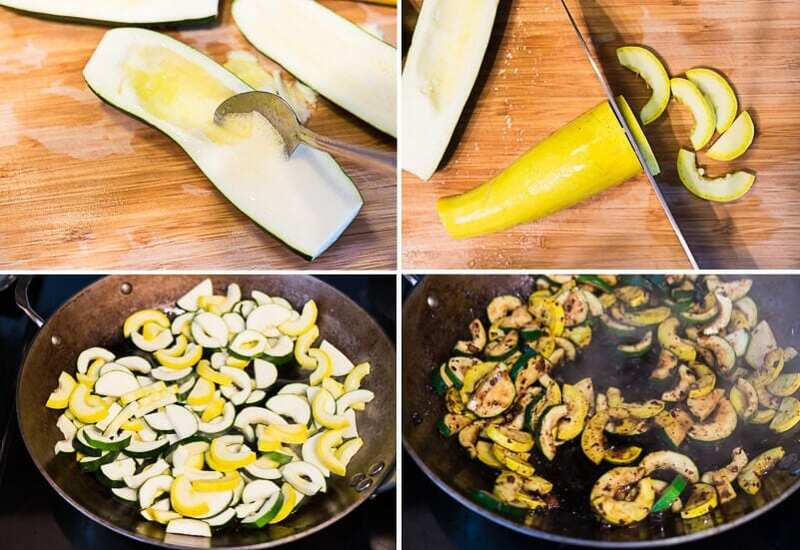 Cook and stir for a minute to coat the zucchini evenly with oil. Add the black bean sauce (or two tablespoons pre-made black bean sauce). 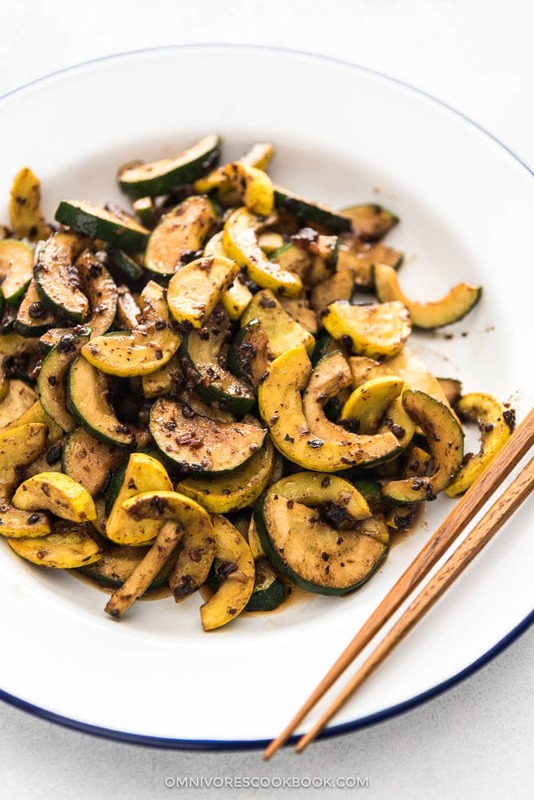 Stir and cook until the zucchini is just cooked through, but not too soft. Carefully taste the zucchini. Adjust the seasoning by adding more pre-made sauce (or salt), if necessary. Looks really good. I was about to ask where do you get the fermented black beans but I just spotted the article dedicated to it below the comments. If you wanted more protein by adding more beans would that ok from a flavor point of view? Homemade black bean sauce? Wow, yes please! How did I miss that post? Black bean sauce is one of my favourite Chinese flavours, and I love how you’ve used it to make a really simple, yummy dish. Glad to hear you like the sauce too Helen! It is super versatile and I use it to cook everything.